Torqeedo, best known for its line of efficient electric outboard motors, now has an inboard model called Deep Blue. The first U.S. installation is in Symphony Boat’s 20’6″ (6.3m) launch. At IBEX 2013 we met Symphony Boat Company founder Marcel LaFond of Duluth, Minnesota. After a lifetime working for other builders, such as Burger Boats and Tollycraft, he ventured out on his own with an unusual boat: an all-epoxy 19‘ 9“ (6m) launch using a “hybrid composite sandwich” in which he vacuum-bagged a 1“ (25mm) foam core to an inside skin of plywood and to 0.09“ (2.29mm) 5052 aluminum alloy sheeting for the external skin. Four panels, plus the transom, make up the hull, which is built over a jig. That boat was powered by a 115-hp (86-kW) outboard motor. LaFond vowed to return in 2014 to compete for an Innovation Award. We didn’t see him that year, but he returned in 2015 with a new boat. The Elektra model is a 20‘ 6“ x 7‘ 6“ (6.3m x 2.3m) center-console launch powered by an inboard Torqeedo electric motor. Torqeedo is well known for its innovative line of electric outboard motors; this installation of its new inboard is the first in the U.S., LaFond says. The hull of the Symphony’s Elektra Six-2 is sheathed in 5052 aluminum alloy sheeting for a cool retro look. Cruising speed with the electric inboard is 5 mph (8 kmh). Torqeedo makes two inboard models: the Deep Blue 40 and 80, with power equivalent to conventional 40-hp and 80-hp (30-kW and 60-kW) gasoline outboards. 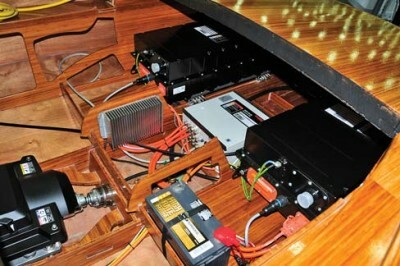 The system includes: high-voltage electric motor; electronic throttle; onboard computer with touch-screen display; Johnson Controls high-voltage battery; charger; 12V battery to power up the system; and connection box and cables. Here are a few specs for the 40: continuous input power 25 kW; propulsive power 16.2 kW (22 hp); maximum efficiency 54%; nominal voltage 345V; motor weight 176 lbs (80 kg); weight of one battery 328 lbs (149 kg). A sophisticated hybrid system incorporating a diesel generator and AC charger is available. Solar panels might be considered intelligent “get home” accessories. The Elektra Six-2 launch is built of laminated panels of bamboo, produced by Lamboo Inc. The electric inboard wasn’t the only surprise from LaFond, however. 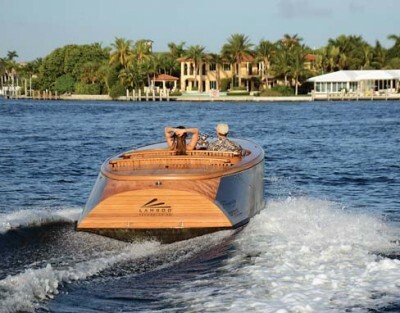 Rather than employ okoume plywood, as in the previous boat, this time he used a product from Lamboo Technologies that, as its name implies, is developed from bamboo. The laminated panels are marketed for exterior building walls and ceilings, trim, playground structures, handrails, screens, awnings, and—in what appears to be its first marine venture, thanks to LaFond—hull construction. LaFond thinks it can also be used for decks, railings, stair treads, and other components. It’s available in various colors; recommended finish is Sikkens Cetol. LaFond says his boat’s cruising speed is 5 mph (8 kmh). And, of course, it’s as quiet as a Prius and doesn’t directly pollute the air or water. Symphony Boat Co., 909 W. Skyline Pkwy., Duluth, MN 55806 USA, tel. 218–213–0698, website www.symphony boat.com. Torqeedo North America, 171 Erick St., Unit A-1, Crystal Lake, IL 60014 USA, tel. 815–444–8806, fax 815–444–8807, website www.torqeedo.com. Lamboo Tech­nol­ogies, 866–966–2999, website www.lamboo-elements.com.